Only very recently an officially recognized style, the NEIPA is notable for being aggressively hopped and unfiltered, creating a brew that's both hazy and juicy. It seems like almost every major brewery is dipping their toes into the water here, and the results have been outstanding. The brewers decided to serve this straight from the tanks: unfiltered, unprocessed and raw, to let all the fruit-forward hop flavors shine. The result is a hazy beer with modest bitterness and intense hop character. It's a hazy little thing called IPA. Don't like IPAs? Prepare for Mother's to change your mind. Chugsuckle features intense dank, resiny and citrus aroma and flavor with a full, creamy mouthfeel. For all the over-the-top flavor, Chugsuckle possesses an unparalleled drinkability. Ballast Point's trophy beer, extra hopped and unfiltered. The Unfiltered Sculpin IPA packs extra hops into every sip, enhancing the classic Sculpin notes of fresh apricot, peach, mango and lemon with a slight haze and less bitterness. Freshness is key; store cold and drink soon. 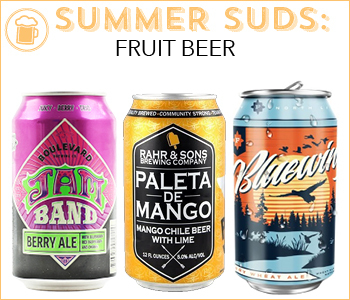 Never let anyone tell you fruit doesn't belong in beer. The addition of mango, grapefruit or raspberry can open up a whole new world of elegant flavors and expressions in a beer. Palate pleasing; juicy and tropical flavors of ripe mango, fresh lime and Mexican pequin chiles! Saludios! An American wheat beer with blueberries added after fermentation. The fruit zooms out of the glass to greet you and then balances sweet and tart flavors to create an easy drinking and refreshing experience. Adding fruit to IPAs may be old news, but lately the category is seeing tremendous growth. We guess word got out that the bright fruit flavors intermeshed with the bitter hop profile can make an already great IPA even more drinkable. This beer begins with a very pale West Coast IPA devoid of caramel malt character to allow the fruity aromas and flavors of Simcoe Glacier hops to take center stage and meld perfectly with unreasonable amounts of mangoes added to this fruit beer with attitude. Brewed with mouth-puckering lemon flesh, sweet orange peel and blood orange juice, Flesh & Blood balances the resinous hoppy characteristics of an American IPA with the explosive zesty fruitiness and subtle drying tartness of citrus to deliver a highly quaffable ale that's incredibly unique and lovely to drink the whole year round. Stone uses bountiful real whole tangerine puree, which brings pithy, crisp bitterness to the citrus flavor. They judiciously employ just a hint of whole pineapple for a back-note. They're not looking to appease the "I want my beer to taste like fruit juice" crowd. 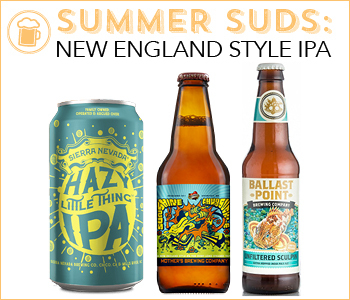 Stone likes their IPAs to taste like IPAs--big, bold and not for kids. Sours may seem like a broad and daunting category, but Colonial is here to help you get your feet wet. From tart to puckering, from Gose to Gueuze, from Berliner Weisse to Flanders Red, there's something for everyone in the vast world of sour ales. This Leipzig-style Gose undergoes a spontaneous fermentation similar to Belgian-style Gueuze/Lambic beers, and exhibits a complexity of acidic flavor and aroma contributed by wild yeast lactic fermentation. Lemon, lime and other citrus-like qualities are balanced by coriander and a mineral-mouthfeel from added sea salt. Men's Health writes: "SeaQuench Ale is a session sour mash-up of a crisp Kolsch, a salty Gose, and a tart Berliner Weiss brewed in sequence with black limes, sour lime juice and sea salt to make this the most thirst-quenching beer Dogfish Head has ever brewed." Nomads: constantly moving, 'round and 'round, sometimes settle, if just for a bit. Perhaps the muse moves one to brew a sharp and clean session beer, one inspired by the Berliner Weisse of old, and the nomad rests. Enjoy this beer here, there, perhaps north of Madison Square Park in lovely New York City. Wherever you are, this beer was made nice, simply for you. Refreshment follows these beers! Come and talk to one of our Celebration Specialists to get matched up with yours.